Fritillaria uva vulpis are one of the easiest of all fritillaria to grow. Long lasting purple and gold flowers in late spring. Also known as the ‘Fox Grape Fritillary’ it is originally from Iran through to Turkey, and thrives in a area with hot dry summers. So in many areas of Australia this species grows well. It is a species that is a little variable in colour as well as in growth habit, however still very easy in a well drained soil. 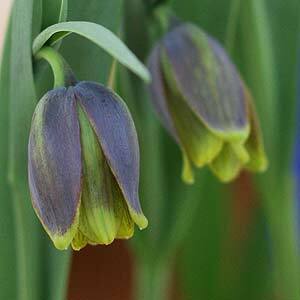 Part shade to full sun in a well drained position is best for Fritillaria Uva Vulpis which are a late spring to summer flowering bulb. Fritillaria Uva Vulpis bulbs do well in pots or in the rock garden. In the garden plant the bulbs around 8cm deep and 4 cm apart. In pots you can plant them more closely if you lift and repot with fresh potting soil each year. In areas where soil is likely to remain wet over winter you will need to improve drainage to prevent the bulbs from rotting. Dig in some coarse material, or raise up the garden bed a little. If you have deciduous trees, these bulbs will grow well beneath them and will flower before the foliage on the trees returns in spring.